Posted from Worthing, England, United Kingdom. 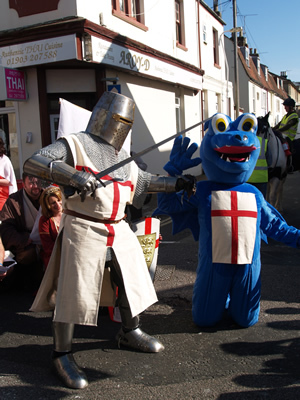 The 23rd April is St Georges Day! The 29th April is the Royal Wedding in Westminster! This knight in shining and ‘orribly heavy armour will be waving a fond farewell to the town of Worthing this St Georges Day, and marching in full medieval clobber up to the capital over 55 miles away to cast a rose, (from The Rose and Crown in Worthing) before the carriage carrying the happy couple – the Crown (Geddit? see what I did there? clever eh?) as they wave to the millions of adoring subjects. The walk, in full chain and plate armour weighing in at over four million Kilos (give or take), will take 5 days, walking for around 6 hours per day, plus time added on for the slaying of any dragons I happen across on the journey. I will be seeking refuge and refreshment at random establishments on the way, armed only with a smile, English charm and a good cause (besides the 3 foot fearsome sword) to win enough grub to keep me alive and enough booze to keep me refreshed. Please, please donate your groats and gold to the wonderful Chestnut Tree House (That’s Groats. no goats please – their horns get stuck in the letter box), the only children’s hospice in our area, by clicking on the link below. 3 Responses to 5 Days… 55 miles… One Lonely Knight. Good luck Colin! Rather you than me. I’ll do what what I can to support your efforts. Hello , there was a group of us who saw you tonight, and had picture taken.